I've been asked several times how I make the borders by alternating colors. 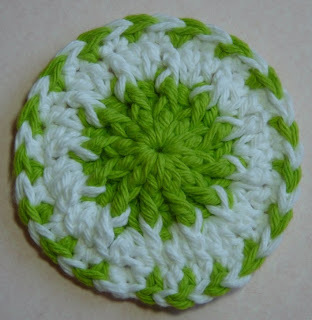 This basically just follows the same instructions on my changing colors tutorial, you just do this on every stitch. 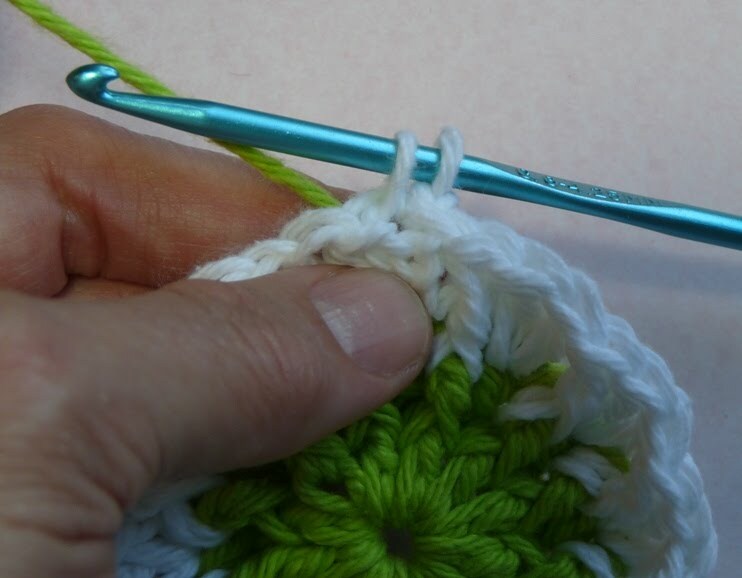 I've done this a lot when I make my scrubbie dot pattern, so I'll use that as the example for this tutorial. 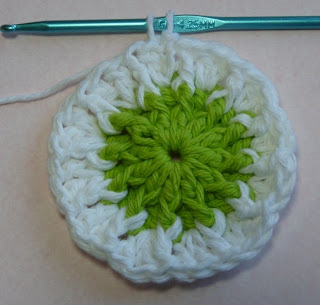 Step 1) When you finished the prior round of the scrubbie dot, you sl st to join the rounds, then you ch 1. This is where you'll be ready to start the border. 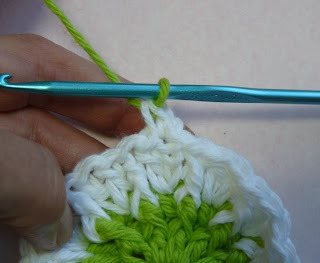 Insert the hook into the same st as the ch 1 and pull up loop, you now have two loops on the hook as seen in the photo #1. 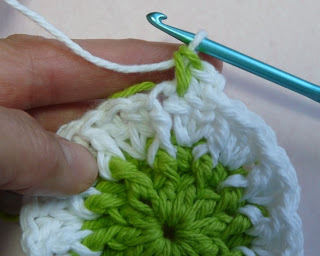 Step 2) With the two white loops still on the hook, bring in the green yarn and hold alongside the stitches on the hook. With the hook, yarn over, and "grab" the green yarn and pull thru the two white loops on the hook, as seen in photos #2 & #3. The white stitch has been completed and the green yarn is on the hook to begin stitching the next green stitch. Step 4) Now yarn over and "grab" the green yarn, and pull up a loop as shown in photos #5 & #6. 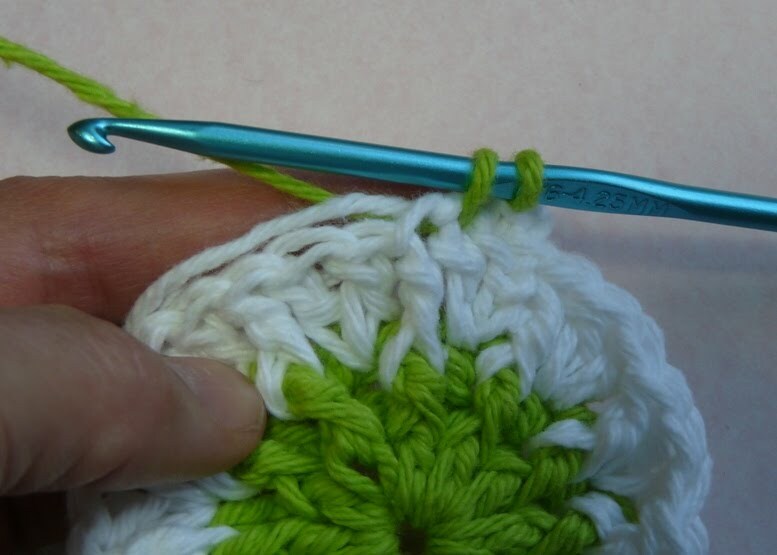 Step 5) Notice in the photo #6, the green working yarn is being held and the white yarn is laying along the stitches? Now you'll need to switch them. Let the green yarn lay across the stitches, and pick up the white yarn that will now be used, as shown in photo #7. Yarn over, and "grab" the white yarn and pull thru the two green loops, photo #8. 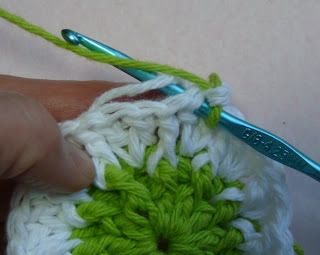 Step 6) The green stitch has been completed and the white yarn is on the hook to stitch the next white stitch. Repeat steps 3-5 for each stitch around, until you get to the last stitch. 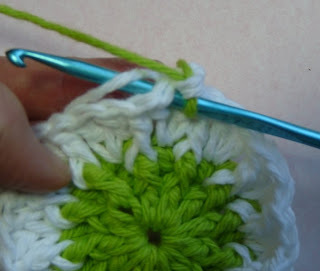 Step 7) The last stitch should be a green stitch. Follow steps 3 - 5 so that you complete the green stitch and end up with a white loop on the hook. Sl st to first white sc in round and finish off. 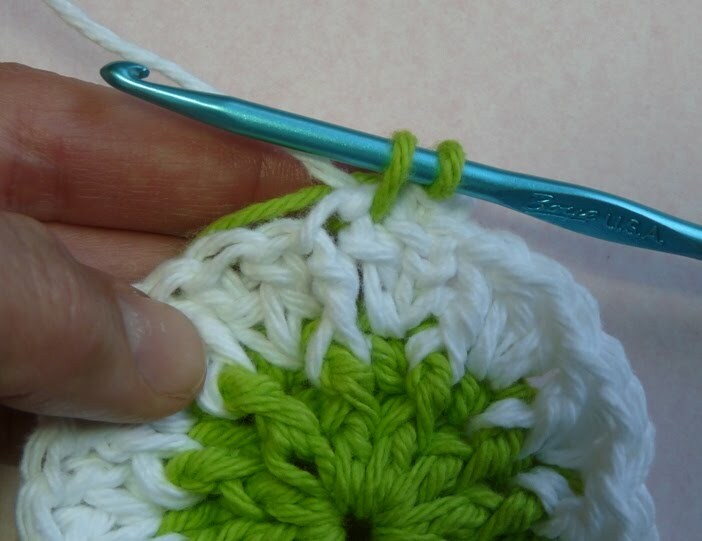 Having the white loop on the hook after the last stitch enables you to use the same color yarn when joining the rounds. I am going to tackle this. I have a lot of yarn and it needs worked with, it is mad at me because it has sat in balls or on cones too long. It wants to be made into something and get a new home, or a t least a new place to sit in my home. Great tutorial! I Love it. thanks for sharing. Thanks so much for the great tutorials. They are explained precisely and the pics are a great visual. Your patterns are also well written..that can be half the battle!! Thanks again!